Aside from government regulators, companies are monitoring the space. Crypto as a Bank of International Settlement representative said is an “evil spawn of a crisis”. By design, coins are meant to supplement and even replace traditional government-issued currencies. Ravaged by hyperinflation and a total lack of trust for fiat, Venezuelans are using crypto to pay for their day to day expenses. On the other hand, Ripple is banking on xRapid, xCurrent, and xVia to replace the SWIFT of which majority of the global banks are using. The unfortunate thing is that it has been weaponized and at the height of Iranian–US feud, the US government threatened to cut off Iranian banks from the money payment network. Such a move would be disastrous for locals, and while banks might find an alternative, subsequent shocks would be damaging for live savings. Therefore it is a no-brainer to see Western Union, one of the world’s largest non-bank remittance companies maintaining a bullish outlook on crypto and Ripple. Their eventual integration depends on the level of adoption. At spot rates, XRP is down five percent in the last day and 23 percent in the previous week. Still, this is positive and is just but the necessary foundation for higher highs above 40 cents and even 60 cents in weeks ahead. While the community is overly confident, bulls are yet to break and close 40 cents. There is a retracement from Dec 20 highs, but as long as prices are trending above 33 cents or Nov lows, we shall consider every low another buying opportunity in line with our last XRP/USD trade plan. In the 4HR chart, XRP bulls are slowing down. After a week of double-digit gains on a weekly basis, the retrace is a gift. What’s positive about this correction is that accompanying volumes are low and trending above 33 cents. As such, bulls are technically in charge. Therefore, if prices drop below 35 cents, XRP prices might retest 33 cents, and it is at this level that we expect buyers to enter at fair value. However, the best approach is to wait for gains above 40 cents–an important level in our analysis. Long entries would be more appealing if this backed by average volumes exceeding Dec 20, 1100 HRs of 26 million. 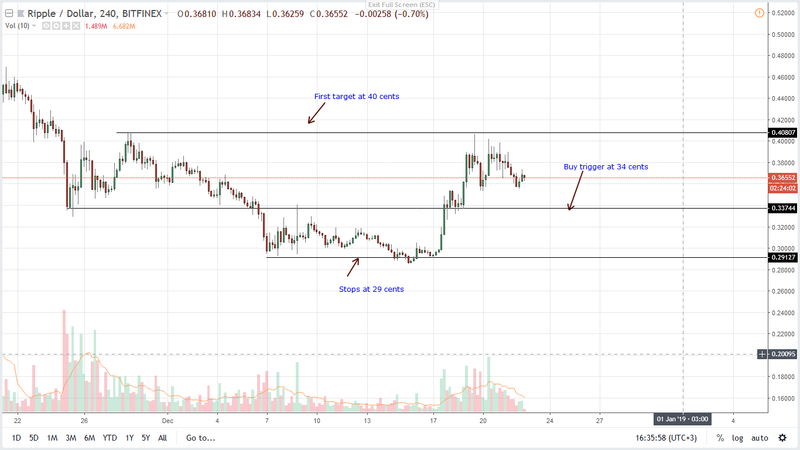 The post Ripple Price Analysis: XRP Bullish, Break Above 40 Cents Vital For Bulls appeared first on NewsBTC.